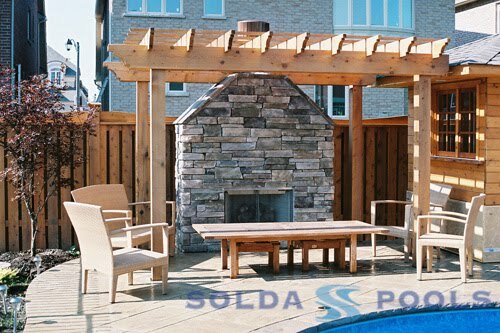 Desire to Decorate: To pool or not to pool? While it would be lovely to have a cottage to call our own, investing in our backyard seems to be more in our cards. So the next topic of discussion is... to pool or not to pool? B being the competitive swimmer and all, he of course is favouring having a pool, me, I just want another place to enjoy family time with my boys and of course, another place to host family and friends. 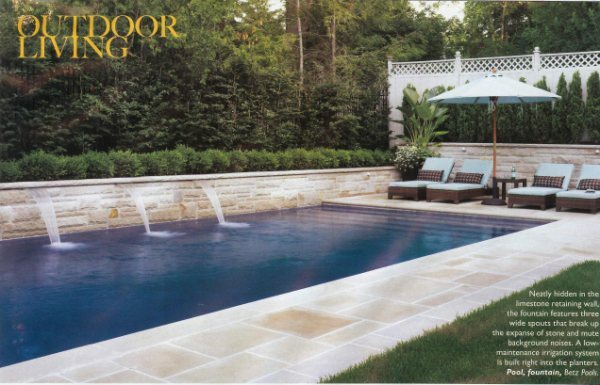 That said, ever since I saw this backyard oasis in the April 2009 issue of Canadian House & Home, I'm now 80 / 20 pool. Of course, ours would be much smaller however, I love the way this outdoor space invokes feelings of some, always needed, R & R.
The only issue I have about getting a pool is that it requires us to loose all the grass... our lot is simply not big enough to have both. And, while some may be able to easily overcome this aspect, I think about our boys not having an outdoor space for a play set or space to toss a ball or play a game of soccer (that's gated for safety). So for now, I just don't know if I'm sold on a pool yet. 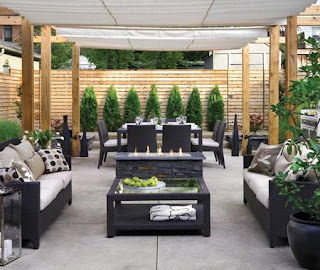 I do know, that I'm loving the idea of having a beautiful backyard that's surrounded by different shades of green, has place for outdoor dinning and a casual sitting area possibly with a fireplace (wink, wink), covered with a pergola. Here are some dreamy pictures... unfortunately, not many pictures are sans pool. Photo credits; Canadian House & Home, Sarah's House Season 2, Solda pools and Gibson pools.